* Partial Bible (New Testament except for The Voice, which only has the Gospel of John). The colors represent somewhat arbitrary groups. 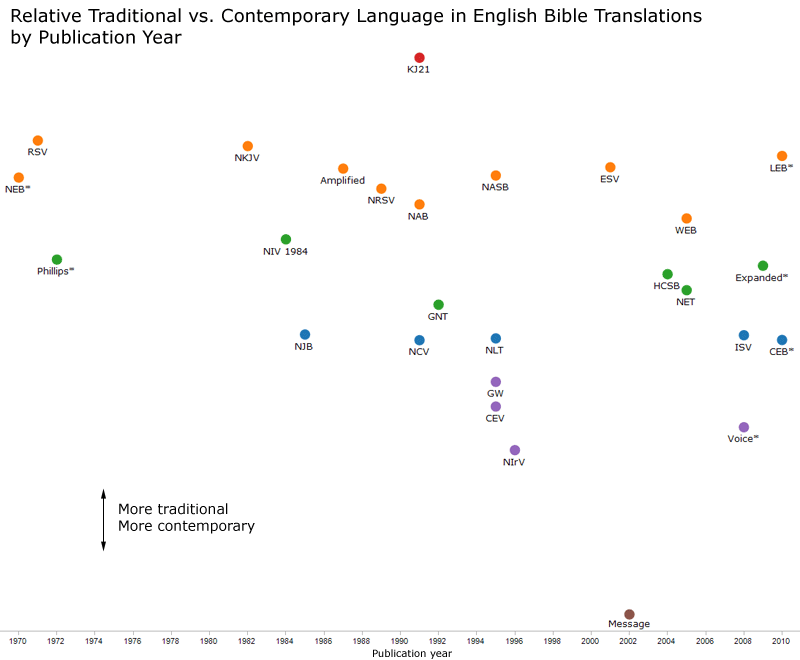 I’m not sure what to make of the curious NLT grouping in the first chart above: the five translations are more similar than any others. In particular, I’d expect the new Common English Bible to be more contemporary–perhaps it will become so once the Old Testament is available and it’s more comparable to other translations. 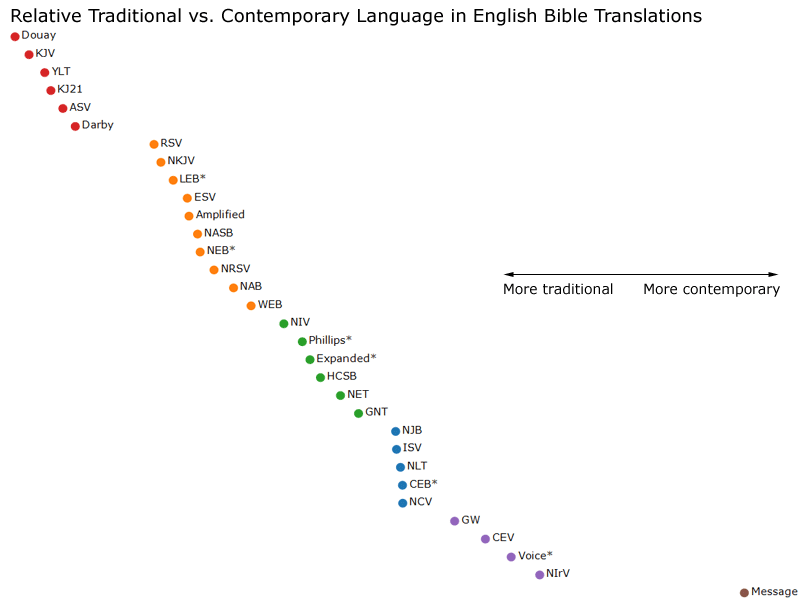 In the chart with publication years, notice how no one tries to occupy the same space as the NIV for twenty years until the HCSB comes along. The World English Bible appears where it does largely because it uses “Yahweh” instead of “LORD.” If you ignore that word, the WEB shows up between the Amplified and the NASB. (The word Yahweh has become more popular recently.) Similarly, the New Jerusalem Bible would appear between the HCSB and the NET for the same reason. The more contemporary versions often use contractions (e.g., you’ll), which pulls their score considerably toward the contemporary side. 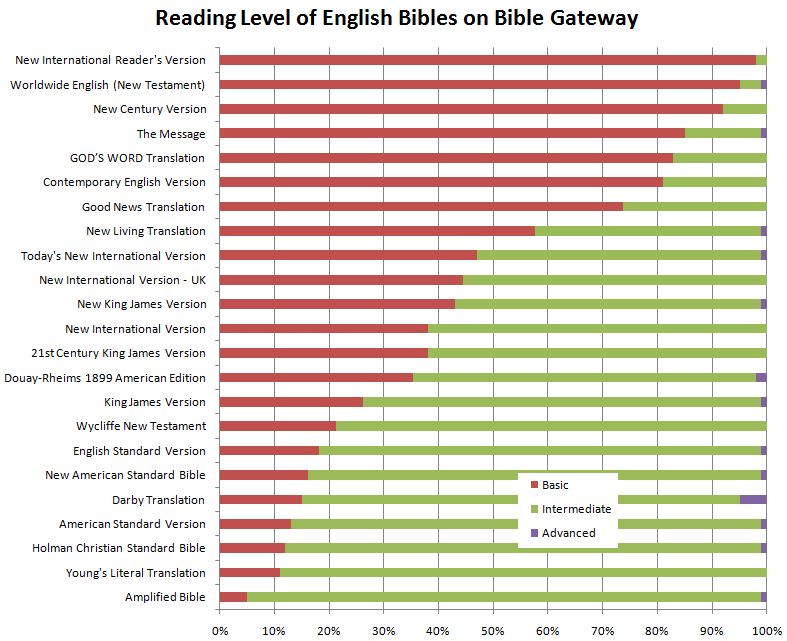 Religious words (“God,” “Jesus”) pull translations to the traditional side, since a greater percentage of books in the past dealt with religious subjects. A religious text such as the Bible therefore naturally tends toward older language. If you’re looking for translations largely free from copyright restrictions, most of the KJV-grouped translations are public domain. The Lexham English Bible and the World English Bible are available in the ESV/NASB group. The NET Bible is available in the NIV group. Interestingly, all the more contemporary-style translations are under standard copyright; I don’t know of a project to produce an open thought-for-thought translation–maybe because there’s more room for disagreement in such a project? I downloaded the English 1-gram corpus from Google, normalized the words (stripping combining characters and making them case insensitive), and inserted the five million or so unique words into a database table. I combined individual years into decades to lower the row count. Next, I ran a percentage-wise comparison (similar to what Google’s ngram viewer does) for each word to determine when they were most popular. Then, I created word counts for a variety of translations, dropped stopwords, and multiplied the counts by the above ngram percentages to arrive at a median year for each translation. The year scale (x-axis on the first chart, y-axis on the second) runs from 1838 to 1878, largely, as mentioned before, because Bibles use religious language. Even the LOLCat Bible dates to 1921 because it uses words (e.g., “ceiling cat”) that don’t particularly tie it to the present. I work for Zondervan, which publishes the NIV family of Bibles, but the work here is my own and I don’t speak for them. Google recently introduced a “Reading Level” feature on their Advanced Search page that allows you to see the distribution of reading levels for a query. URLs don’t have a 1:1 correspondence to passages, so some passages get counted twice while others don’t get counted at all. Google doesn’t publish its criteria for what constitutes different reading levels. These numbers are probably best thought of in relative, rather than absolute, terms. Searching translation-specific websites yields different numbers. For example, constraining the search to esvonline.org results in 57% Basic / 42% Intermediate results for the ESV, massively different from the 18% Basic / 80% Intermediate results above. Download the raw spreadsheet if you’re interested in exploring more. You are currently browsing the OpenBible.info Blog blog archives for December, 2010.